Wings Spirit: Happy Mother's Day! 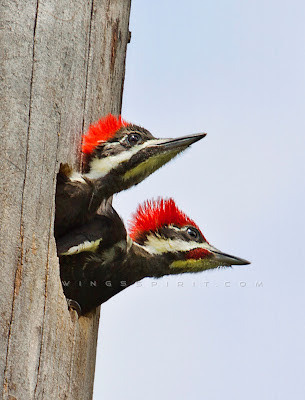 Nikki asked me " Linda, have you seen Pileated Woodpecker (Dryocopus pileatus) babies? ", I said with a regretful tone "Nope, but I wish I have though...." If you guys follow my posts, you must know I am fascinated with all avian newborn and who doesn't, right, you might say. However, you do require special attention and birding etiquette to photograph nestlings because as we get close to the nests, we might attract unnecessary attention for predators. Nikki told me she spotted some Pileated babies and gave me a "wink" saying that "we need someone who can photograph these cute babies before they fly ...." After the field trip, I raced to the site Nikki told me earlier. First of all, I got sidetracked by this huge Red-tailed Hawk soaring over my head. The first impression came to my mind was "Oh, no!...The Pileated babies might be in danger...I'd better find them quick." I was ready to guard the nest as long as I can or until their parents show up. Due to the overcast, I worried that my camera might got soaked in rain and soon found out there was a small gazebo right next to the nest and I was so relieved! 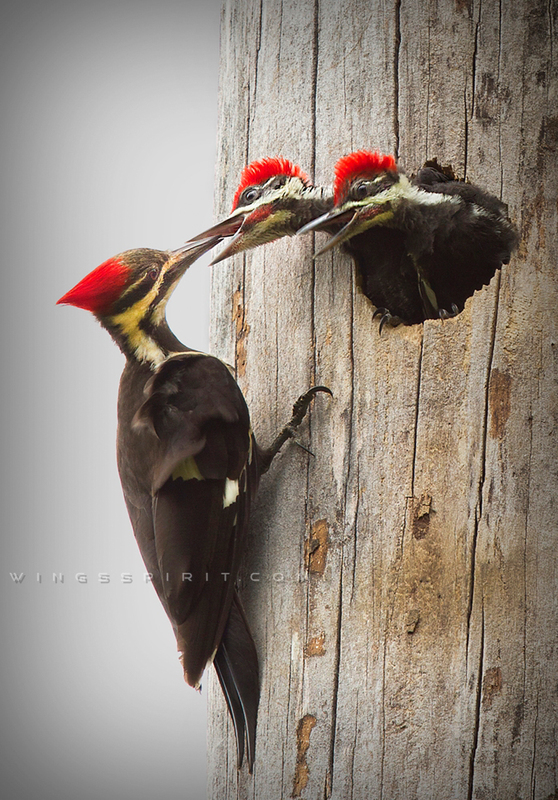 Pileated Woodpeckers are monogamous and they stay together year round to defend their territory. Male excavates nesting hole from a dead tree or tree log and mother woodpecker gives the final touch to complete a lovely nest for their newborn. They don't reuse their nest and since they don't put any nesting material inside the tree hole, often time these old cavities from Pileated Woodpecker become important nesting sites for many birds such as Wood Ducks, swifts, and many other cavity nesting birds such as Eastern Bluebird, Red-headed Woodpecker and Red-bellied Woodpecker. Though, Pileated Woodpeckers are not endangered, a mature forest with dead trees is very important to them, their offspring and many other smaller birds. One thing I find fascinated is that one will think a bird this big must eat a lot. They do! But do you know about 40% or more of their diet is consuming termites and carpenter ants!! Their existence not only benefits other birds, they benefit human too (I support Biological Pest Control)!! I am blessed to have a mature forest in my backyard. Few years ago, a friend recommended to cut down all dead trees to avoid trees falling towards the house from storms or lightening. I never did any thing to those dead trees or snags and thought they were uniquely beautiful (I was not a birder then.....). And, I now find a reason, a great one! A resident told me he saw three baby woodpeckers in the nest. I only see two babies at any given time. If you look at these two images carefully, you might agree there are at least three babies inside the nest. In this picture, female is the one to the left, male is the one with red malar. It takes about 4 weeks to fledge. Lovely pix - I'll subscribe as I live in Atlanta now and like to know the birdy doings here. I saw the post on the GABO list. Thanks! I also added you to my blogroll (cindymcintyre.wordpress.com). Your photography is tops!